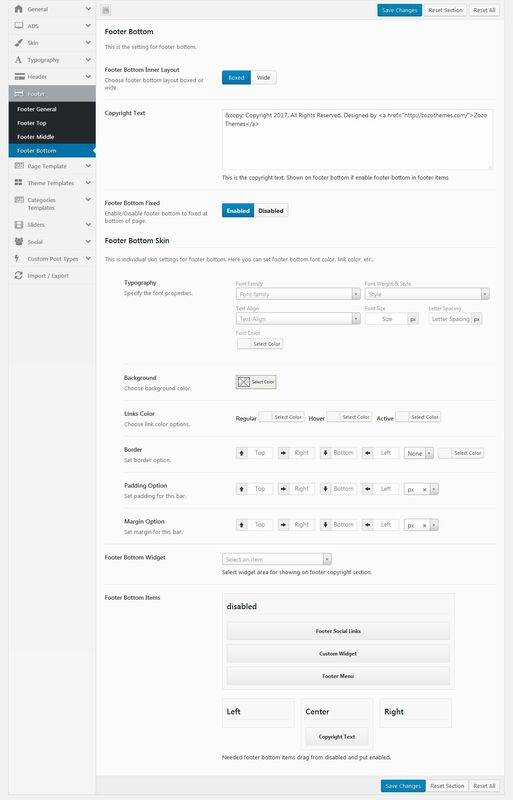 Footer Bottom Inner Layout: Choose your footer bottom layout boxed or wide. Copyright Text: Here you can set copyright text which is show on footer copyright part. Footer Bottom Fixed: You can Enable/Disable footer bottom to fix at bottom of page. When scroll at bottom of page then only it’ll show. Footer Bottom Skin: Choose your individual skin setting for footer bottom. You can set for footer bottom property like typography, background color, link color options, border, margin option, and padding option. Footer Bottom Widget: Select your widget item for showing on footer copyright section. Item like secondary menu sidebar, footer1, and footer2 etc. Footer Bottom Items: Needed footer bottom items drag from disabled and put enabled.